There is increasing world-wide interest in obtaining an understanding of various multiphase flow phenomena and problems in terms of a common language of multiphase flow. This volume contains state-of-the-art papers which have been contributed from all over the world by experts working on all aspects of multiphase flows. The volume also highlights international technology-sharing in the fields of energy, environment and public health, in order to create a brighter and sustainable future for man and for all life in the next century. 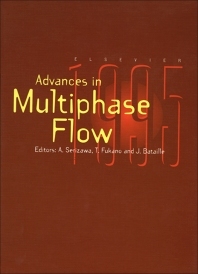 It is intended that this volume will serve as a major source of literature for the advancement of multiphase flow and allied fields. A Selection of Contents. Particle, Bubble and Spray. Effects of Eötvös number and dimensionless liquid volumetric flux on lateral motion of a bubble in a laminar duct flow (A. Tomiyama et al.). Bubble and particle behavior in Taylor- and spiral-vortex flows (Y. Shiomi et al.). Interactions between particle wake and turbulence in a water channel flow (PIV measurements and modelling for turbulence modification (A. Hanzawa et al.). The continuum equations for particle motion in turbulent two-phase flows (K.E. Hyland, M.W. Reeks). Experimental and computational investigation of particle-particle interactions in a vertical, sudden expansion liquid-solid flow (M.A. Founti et al.). Momentum exchange between fluid and particles and mutual collisions among particles in saltation layer (T. Tsujimoto et al.). Modeling and Numerics. Polarization of an object in a potential flow: some theorems and applications to ellipsoids (G.B. Wallis). Prediction of turbulence modulation by using &kgr; - &egr; model for gas-solid flows (T. Yokomine, A. Shimizu). Study on closure equations of droplet drag and interfacial shear stress for three-field model (Y. Abe et al.). Nonequilibrium modeling of two-phase critical flow (T.K. Chen, J.L. Xu). Interfacial, Liquid Film and Separated Flow Phenomena. Marangoni effects on wave structure and liquid film breakdown along a heated vertical tube (A. Ito et al.). Mass transfer into liquid film flowing concurrently with gas flow (The prediction of the average mass transfer coefficient) (T. Fukano et al.). Turbulence structure as a gas-liquid interface (S. Kumar et al.). Two-fluid model of separated two-phase flow: momentum transfer on wavy boundaries (A. Liné, D. Lopez). Internal Flow and Flow Pattern. Experimental investigation of void profile development in a vertical cylindrical pipe (C. Grossetête). The effect of pressure on slug frequency in two-phase horizontal flow (I.G. Manolis et al.). Pressure drop reduction of liquid-particles two-phase flow with nearly equal density (H. Monji et al.). Initiation of a hydraulic jump on co-current air-water flow (J. Katayama et al.). Phase Change, Heat Transfer and Nuclear Safety. Interfacial parameters for vertical condensing single-component two-phase flow (I.F. Obinelo et al.). Visualization of boiling two-phase flows in vertical annuli (T. Mizuno et al.). Low quality flow condensation inside a vertical tube in the presence of a noncondensable gas (H.K. Oh et al.). An attempt to model stratified thermal explosions with the multidimensional, multicomponent code MC3D (C. Brayer, G. Berthoud). CHF in a boiling channel under oscillatory flow condition (H. Umekawa et al.). Tube Bundles and Porous Media. Flow induced vibration of tube bundles subjected to single- and two-phase cross-flow (W. Mann, F. Mayinger). Local two-phase flow measurements in a cross-flow steam-generator tube bundle geometry: the Minnie II XF program (J.F. Haquet, J.M. Gouirand). Fluidized Beds. Velocity analysis of the solid phase in a circulating fluidized bed (E. Azario et al.). Jet particle velocity in a jetting fluidized bed with conical distributor (J.C. Bi et al.). The upper limit of the similar profiles regime in vertical gas-solids suspension flows (Y. Molodtsof). Instrumentation. Last progress in generalized Lorenz-Mie theory with applications in multiphase flows (G. Gouesbet, G. Gréhan). Coherent anti-stokes raman scattering: application to coal-fired flow facility (J.P. Singh, F.Y. Yueh). Evaluation of the phase doppler technique for the measurement of bubbles (Y. Hardalupas et al.). Bubble shape and interfacial area concentration measurements in upward and downward bubbly flow (I. Zun et al.). Author Index.